The Multilin 869 relay is a member of the Multilin 8 Series protective relay platform and has been designed for the protection, control and management of medium and large induction and synchronous motors. The Multilin 869 provides advanced functionality for various types of applications such as high-speed protection, extensively customizable programmable logic, advanced motor monitoring and diagnostics, and flexible configuration capabilities. The Multilin 869 Motor Protection System is a protection device designed for the management, protection and control of medium to large horsepower motors. 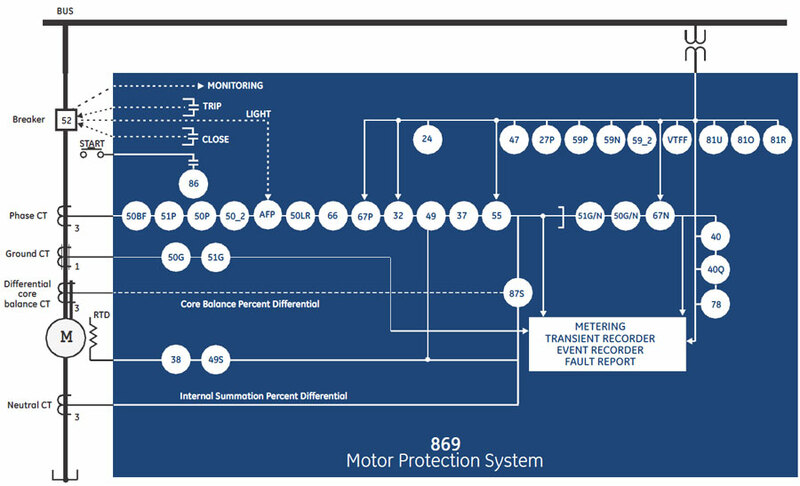 The 869 provides comprehensive protection and control of various types of motors with different loads they run. With a fast protection pass, running every 1/8th of a cycle, the 869 relay provides faster current, voltage, power and frequency protection elements ; helping reduce stress on assets. 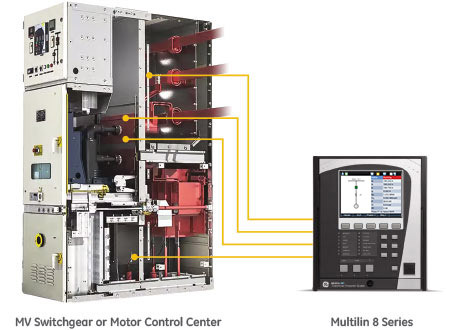 The Multilin 869 supports the latest standard communication protocols, including IEC 62439/PRP and IEC 61850 Ed2 ; facilitating easy integration into new or existing SCADA/DCS networks. The voltage dependent overload curve feature in Thermal Model is tailored to protect motors which are used in high inertia load applications. Voltage is continually monitored when the motor is started and during acceleration. The thermal limit curve is then adjusted accordingly. This enables the Multilin 869 to distinguish between a locked rotor condition, an accelerating condition and a running condition. The Multilin 869 provides protection for motors fed through VFDs (Variable Frequency Drives). A wide range of the frequency tracking (3-72Hz) allows the 869 to track the motor frequency and adjust its sampling rate to accurately measure phasors. An advanced algorithm allows switchable current and voltage tracking in case VFD is bypassed. Thermal protection also considers the extra heating generated by the higher harmonics due to VFD to achieve the accurate response to the actual motor heating. RMS currents fed to the various motor protection elements are further processed through the averaging filter to eliminate oscillations in current signals to ensure the security. Additionally, users may indicate a starting VFD frequency that helps the device to track the motor frequency faster and therefore accurately measures the phasor quantities, which, otherwise, could cause delayed or false protection operation of the protection. 869 provides functions essential to protect the synchronous motor during asynchronous operation while startup, during normal and overload operations and under fault conditions. In addition to stator protection and control, it provides protection and monitoring of exciting rotor during pull-out or loss of synchronism condition with elements like Out-of-Step, Loss-of-Field, Reactive Power, and Power Factor. With its well established and matured Thermal Model, it prevents overheating of both stator and rotor windings during both synchronous and asynchronous operation. During asynchronous operation or startup, the thermal model with VD (voltage dependent) function provides protection against excessive heating in the damper winding due to stalled or locked rotor conditions. 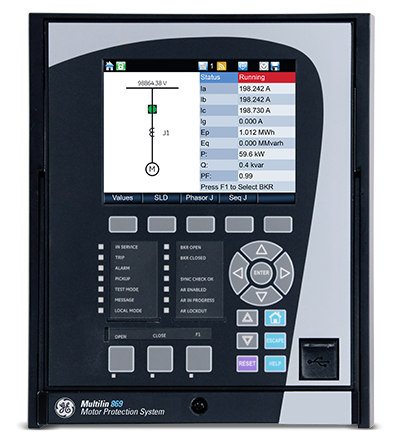 The Multilin 869 offers an integrated, cost effective Monitoring and Diagnostics features that leveraging existing relay data without the need for additional devices, sensors, wiring or training. Motor failures and faults can have a significant impact on a process, resulting in loss of revenue and material. Predictive maintenance and situational awareness to the motors operating condition can help reduce unplanned downtime and energy consumption - maximizing motor output and life. 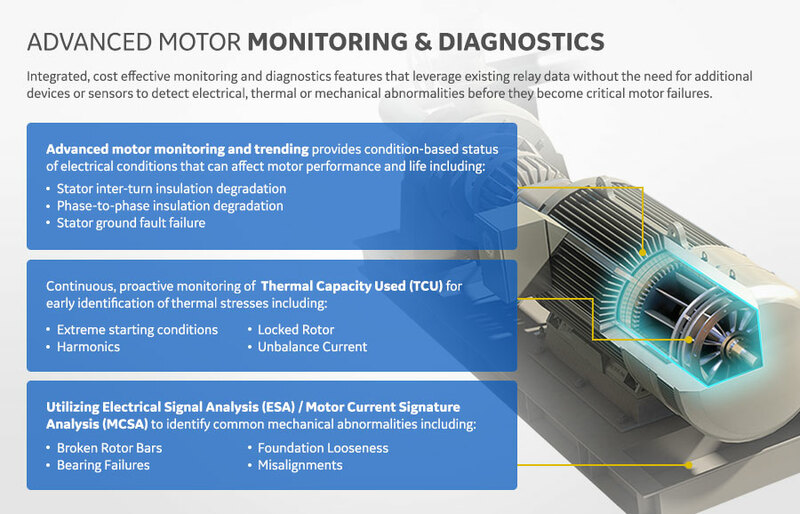 Motor monitoring & diagnostic features include stator turn to turn fault, broken rotor bar detection, roller bearing faults, foundation looseness, eccentricity, and misalignments. 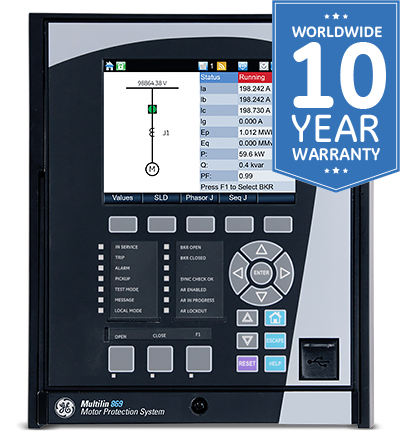 Using advanced Motor Current Signature Analysis (MCSA), the 869 continuously analyzes the motor current signature and based on preset algorithms will determine when an electrical, thermal or mechanical fault / failure condition exists in the motor. The 869 implements a patented environmental monitoring system that measures and provides operating condition information. Reliable and secure operation of the 869 relay and other electronic devices in the vicinity may be affected by environmental factors. The 869 relay has been designed to meet or exceed all required industry standards. Some operating conditions may be beyond those standards and reduce total lifespan of the device. Self-monitoring and diagnostics of the sensors ensures the health of the sensors as well as the full length fiber cables. LEDs on the front panel display of the 869 can be configured to indicate the health of the sensors and its connections to the relay. The 869 provides advanced communications technologies for remote data and engineering access, making it easy and flexible to use and integrate into new and existing infrastructures. 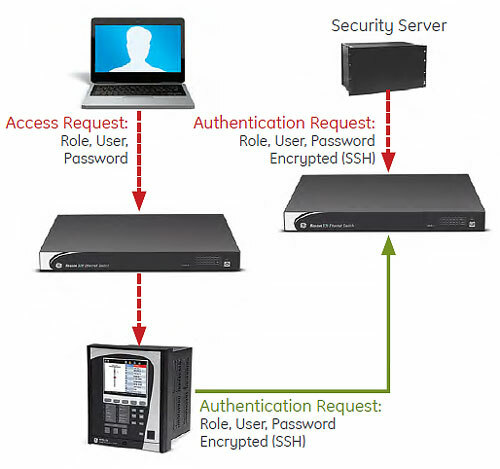 Direct support for fiber optic Ethernet provide	s high-bandwidth communications, allowing for low-latency controls and high-speed file transfers of relay fault and event record information. The 869 also supports two independent IP addresses, providing high flexibility for the most challenging of communication networks.